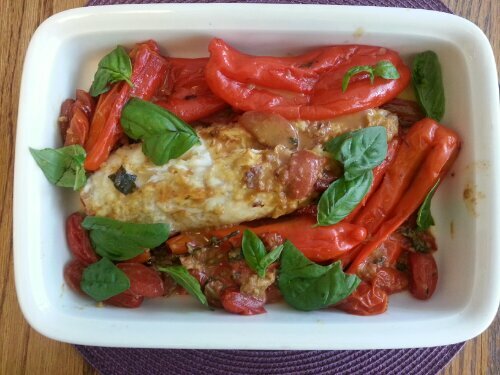 A couple of months ago I found this monk fish recipe on the website of an Italian magazine, “Donna Moderna”. I made it and really liked it so I am posting it here in English. Dust the fish with flour. Clean the peppers and discard the seeds. Wash the cherry tomatoes and cut the largest one in half. Heat some olive oil in a pan and brown the fish on all sides. Set the brown fish aside. Add some more oil in the same pan, add the tomatoes and the peppers. Stir fry a minute and add some white wine, the saffron and a handful of basil leaves. Mix and cook for 10 minutes. Add the monk fish, salt, and cover the pan. Cook for other 20 minutes, adding a bit of water if it gets too dry. Serve with more fresh basil.